A pair of bulgy coolers with short, broad, ringed necks topped by deep crenellations in the form of crowns. They show traces of side handles that are now broken off. The body bears the Sampaio e Melo coat of arms, painted in underglaze cobalt blue and overglaze iron red, green and gold enamels. 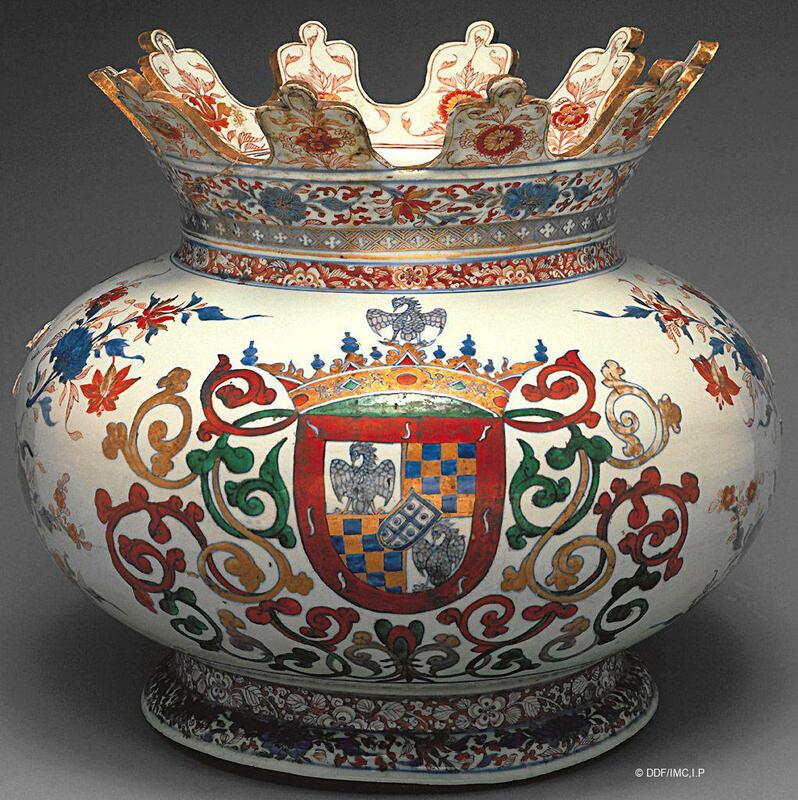 As had happened with pieces commissioned by the Portuguese in the 16th and 17th centuries, the Chinese potters interpreted emblems and the coat of arms in their own way transforming a heraldic element, the lambrequin, for example, into a strictly decorative, complex arabesque drawing. The rest of the decoration is made up of sprays of flowers in Chinese imari colours (underglaze cobalt blue, and overglaze iron-red and gold) and floral borders. The shape was probably inspired by an English silver cooler known as a monteith, which had a removable mount adapted at the top, allowing for the cooling of both bottles and, with the mount in place, glasses. The name Monteith, according to some authors, refers to an eccentric Scottish gentleman, “M. Monteith”, the hem of whose kilt was said to have been indented in the same fashion as the monteith. Other authors present Delft faience from the Netherlands as a possible source of inspiration. 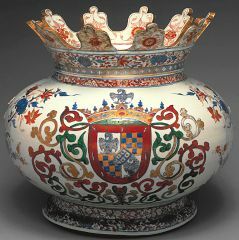 The commission of these vessels have been attributed to members of different Portuguese families, namely Manuel Corte Real de Sampaio from the 5th Government Council of India (1668–1671); Francisco José de Sampaio Melo e Castro, 66th Governor and 40th Viceroy to India from 1720 to 1723; and to the noble family Melo Sampaio, established in the so-called Northern Province of Portuguese India, first in Tana and Baçaim and finally in Goa. The vessels would have been used to keep drinks cool and are part of a large and impressive set. Such vessels were known in the Middle Age, having become fashionable in various countries after being adopted by the court of Louis XIV. This pair of coolers with another pair with the same shape and decoration is unique both in type and shape among the export Chinese porcelain. They are part of a magnificent set that includes cutlery cases, sugar holders and special bottles with covers and trays. The like of this set has not been copied or produced in Chinese export porcelain for other Portuguese or foreign patrons. According to prints of the medieval period it was common throughout Europe,namely around 1683, for large metallic basins with handles to be placed on the ground to hold bottles and ewers during mealtimes. In time these metal prototypes were sent to China by the Portuguese merchants, the East India companies from several European countries and from the USA, as well as by private merchants. Chinese potters copied these vessels in porcelain and decorated them according to clients’ taste. In 1911 both objects were transferred from the Convent of Santos-o-Novo to the Museu Nacional da Arte Antiga. Gruber, A., L'Argenterie de Maison du XVIe au XIXe siècle, Fribourg, 1982. Teixeira, J. M. et. al., Le Triomphe du Barroque, Brussels, 1991. Matos, M. A. de Pinto, “Porcelanas de Encomenda. Histórias de um Intercâmbio Cultural entre Portugal e a China”, Oceanos, No. 14, CNCDP, Jun, 1993. Alves, J. S., Matos, M. A. de Pinto, Antunes, M. S. Lobo and Loureiro, R. M., Caminhos da Porcelana. Dinastias Ming e Qing, Lisbon, 1998. Antunes, M. S. Lobo, Porcelanas, Lisboa: Fundação Ricardo Espírito Santo Silva, Lisbon, 1999. Copyright images: Divisão de Documentação Fotográfica/ Instituto dos Museus e da Conservação, I.P. Maria Antónia Pinto de Matos is a History graduate with a MA in Museology. She is the former Director of the Museum-House of Dr. Anastácio Gonçalves in Lisbon, and currently the Director of the National Tile Museum in Lisbon. She has curated and co-curated several exhibitions in Portugal and abroad on various subjects, and published several books and articles. Maria Antónia is currently preparing her PhD thesis on Chinese Porcelain Produced for the Portuguese Market (1500–1644).